"I think everyone expected to see a man emerge--possibly something a little unlike us terrestrial men, but in all essentials a man. I know I did. But, looking, I presently saw something stirring within the shadow: greyish billowy movements, one above another, and then two luminous disks--like eyes. Then something resembling a little grey snake, about the thickness of a walking stick, coiled up out of the writhing middle, and wriggled in the air towards me--and then another." "A big greyish rounded bulk, the size, perhaps, of a bear, was rising slowly and painfully out of the cylinder. As it bulged up and caught the light, it glistened like wet leather." "They were, I now saw, the most unearthly creatures it is possible to conceive. They were huge round bodies--or, rather, heads--about four feet in diameter, each body having in front of it a face. 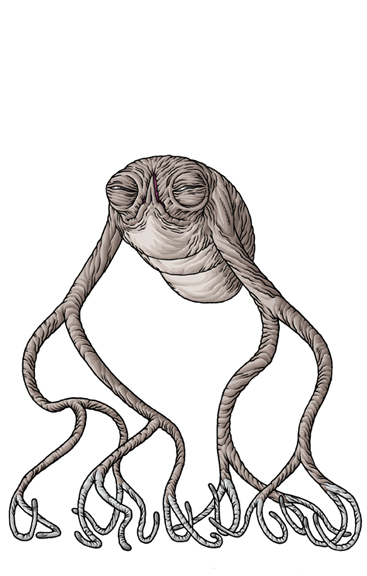 This face had no nostrils--indeed, the Martians do not seem to have had any sense of smell, but it had a pair of very large dark-coloured eyes, and just beneath this a kind of fleshy beak." " In a group round the mouth were sixteen slender, almost whiplike tentacles, arranged in two bunches of eight each. These bunches have since been named rather aptly, by that distinguished anatomist, Professor Howes, the hands." This coming Sunday is H.G. Wells' birthday. To celebrate, I'll be posting a creature tomorrow from one of Wells' best known stories. Wells not only got a mention by HPL in Supernatural Horror In Literature but he's also one of my favorite authors. A master of the science fiction genre before it was really even a genre, he could not only "predict" scientific and social advancements/upheavals but he could tell one hell of a story. He was a friend to Booker T. Washington, founded the charity Diabetes UK, hated Nazis and created the first recreational war game. Truly a man after my own heart. 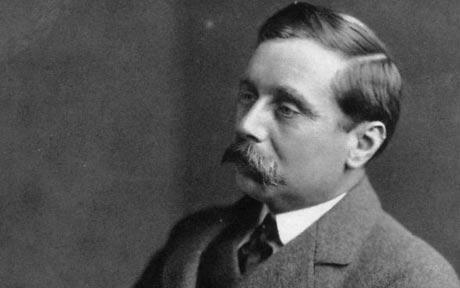 "Mention has been made of the weird work of H. G. Wells and A. Conan Doyle. The former, in “The Ghost of Fear”, reaches a very high level; while all the items in Thirty Strange Stories have strong fantastic implications."